I just picked up the new Nexus 5 (32GB, Black) :) , I am sure you will be supporting that as well... I am dumping my Z10 BB, I really want to be able to use my Alpha Man size ring for unlocking a phone and the Z10 has so little application development going on that it is ridiculous. The alpha should work with the Nexus, I am a 50 pond backer, will any of the other rings work in theory, I know that it was just released and it is too early too know definitely. Hi, I was playing with one of these earlier (when I say 'I', I mean that I was graciously allowed to let a coworker attempt to use the ring). It read an Alpha ring but was being irritable with the normal ring - I did manage to take a picture of where the Alpha was reading. I may have been able to get the Normal ring to work if I'd had more time to play with it, but coworker wanted to do other things! I'm using a Nexus 5 at the moment my normal ring works well with it. I have three go to sweet spots but they do require a bit of accuracy and getting used to. I will try and get a pic up at some point with them highlighted for you. Does it work ok through your phone case? If I can't continue to use my case then I won't be able to get a ring. The business card would be an interesting thing. You could possibly try making the case 'thin' where the sweet spot is... it'd have the benefit of reading and being easy to find if you made a ring sized thin spot. Also try the rolling read where I've marked the sweet spot and see if that helps. If you view this image at full size on your Nexus 5, you should be able to figure out how to get your ring working in no time. Also, the ring being either vertical or horizontal seems to help, angled doesn't work quite as effectively. Yeah... wow. Was that just from your testing? 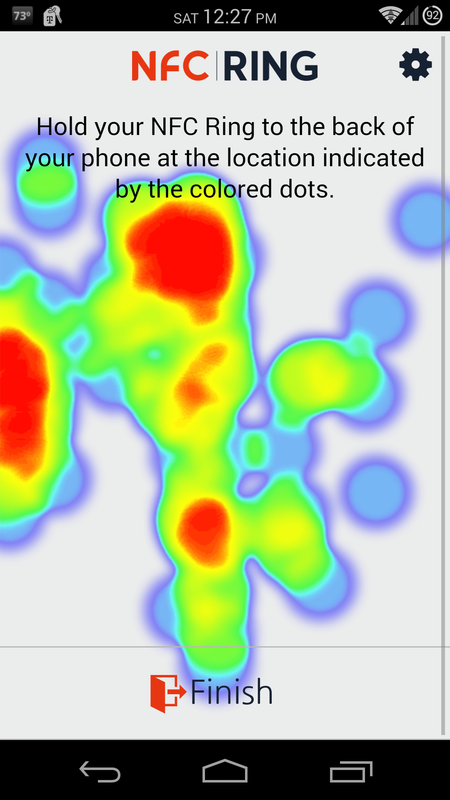 No, actually it's a feature of the NFC Ring control app, it made that heat map. When you go to apply something to your ring, like text, a web URL, or whatever, it pops up the heat map to show you about where to place the ring to get it to activate. Ah, that was my first thought - I've used the ring control app briefly. Looks like a few people are really missing the mark there. I just got my 'stand in' signature alpha ring last night (while I wait for my stealth bomber). I tried it on my Nexus 5, but the only way to get it to work is by removing my case, and even then it is quite sensitive at the sweet spot (bottom left of the phone if looking at the back). I have a Ringke Fusion case, which has a slim sheet of clear plastic on the pack to allow the back of the phone to show through. It isn't much more than a bumper case. This is apparently enough to block the signal from reaching the Alpha ring though. I'd really like it if I didn't have to remove this case. edit: playing with it a bit more...it seems one side of my ring (and I can't tell the difference between the two sides visually) is picked up easier than the other side with the case on. It's still quite sensitive though with the case on. I'm going to give it a go with trying the stronger side as my unlock key. Just wanted to say thanks to Thor79! 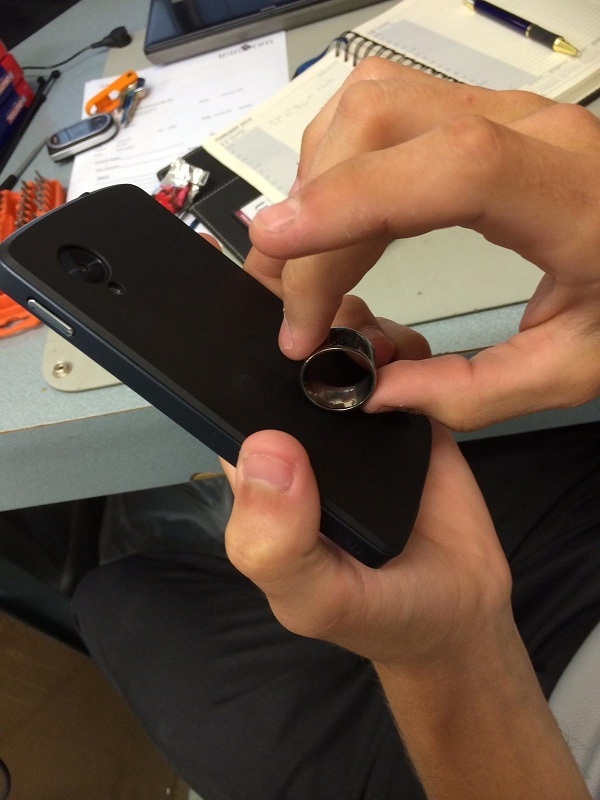 I've been thinking about getting a NFC ring for my Nexus 5 and I use the exact same case (plus a bit of paper inbetween) and I was wondering how well it worked. It's a little disappointing to see that it doesn't work great, but I'm glad to hear that it's at least do-able. Time to scrape together some funds. I'm actually sending mine back to them for them to test it and possibly replace it. One side of my ring has given out completely. The other side is still quite sensitive even with everything off the phone (no case, no dbrand vinyl skin). 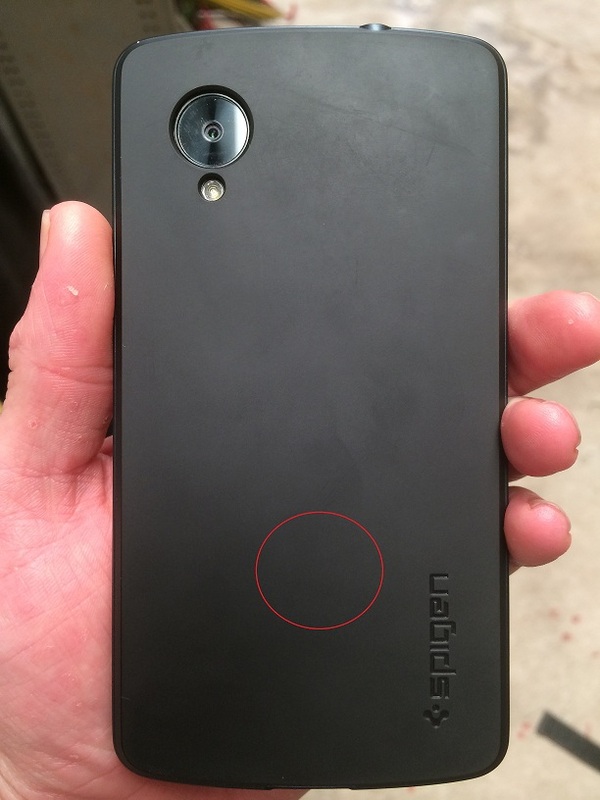 Nexus 5 Sporting the Ballistic SG MAXX Unfortunately the ring will not penetrate the case. I dremmeled through the case and created a pocket for the ring to hit the sweet spot. Leaving the rubber layer in tact . I had not seen this discussion before ordering the ring but had high hopes based on my modified GalaRing being able to break through the case. I quess the smaller custom tag doesnt have the power to get through that plastic. @Redheadkitten mileage varies, even with the same phone model - IMO it's mostly to do with the construction of the phone and how it's been treated over it's lifetime. You may find that it works exceptionally with your phone but you wont know until you try! @Thor79 sounds like you just got a bad ring unfortunately! @bramzee, it's actually that the phone is having trouble 'matching' with the ring, the smaller antenna makes power transfer from phone to antenna a little less efficient and that can have a pronounced effect on a phone that isn't working at it's peak efficiency. My Vintage ring works perfectly (both the clear and black sides) with my Nexus 5, though the official Google red case too. It's true that it takes a bit of practice and obviously, how straight it is around your finger makes a difference. The heat map is a great idea; I love the suggestion, "please be awesome and share your sweet spot so we can improve the map" - I'm sure that helps. It also works fine with my Nexus 7 which is not in a case.